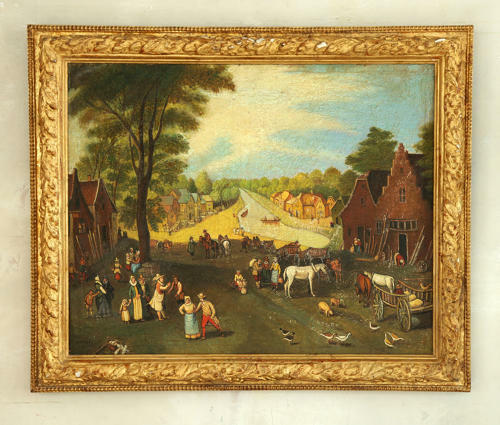 Peasant Village scene after Pieter Breugel by the famous copiest Miguel Canals (1925-95). Miguel Canals, a Barcelona artist whose reproductions have become admired and collectable in themselves. Miguels painted the same size as the originals, in the same media-- oil, pastel, crayon or watercolor-- and set in elaborately gilded plaster or wood frames. On a quick glance they appear to be the real thing. Each is stamped on the back, "From the Studio of Miguel Canals." This example is after Pieter Bruegel was the most significant artist of Dutch and Flemish Renaissance painting, a painter and printmaker from Brabant, known for his landscapes and peasant scenes. Oil on canvas in elaborate gilt frame.